He is one of history's most famous explorers, and his first-person account of a 19th-century massacre in Africa helped lead to the closure of one of the continent's most notorious slave markets. Now researchers say they have evidence Dr. David Livingstone may not have been telling the whole truth. An international team of academics used spectral imaging technology to decode Livingstone's long-illegible field diary and say it hints that his own men may have participated in the atrocity. "Livingstone's party might have been involved in the massacre," said Adrian Wisnicki of Indiana University of Pennsylvania, who directed the project. But he advised caution: "We're only beginning to analyze the evidence." It's an explosive claim, because Livingstone's account of the horror seen in the African village of Nyangwe galvanized British authorities to shut the slave market in Zanzibar, a critical hub for East Africa's human traffickers. Livingstone himself denied allegations that his men had been involved. And while Livingstone biographer Tim Jeal praised Wisnicki's efforts, he said he was skeptical that the Scottish missionary would have tried to cover up his party's role in the killings. "Nobody can know for sure, but I don't think the proof is there," Jeal said. Regardless of the exact circumstances, the Nyangwe massacre was one of the darkest points of Livingstone's career. In his posthumously published "Last Journals," Livingstone described how a "bright sultry summer morning" in July 1871 had turned to hell when slavers opened fire on some 1,500 people at Nyangwe's market. Pandemonium broke out as the marketgoers, many of them women, scrambled for their canoes or tried to swim across the nearby Lualaba River. "Shot after shot continued to be fired on the helpless and perishing," Livingstone said, describing how many others drowned in the river. "Some of the long line of heads disappeared quietly; whilst other poor creatures threw their arms high, as if appealing to the great Father above, and sank." Livingstone said he couldn't know how many had died, although he cited estimates running into the hundreds. When news of the massacre reached Britain, it ignited a wave of revulsion. By 1873, the British consul had pressured the sultan of Zanzibar to close the island's large slave market. 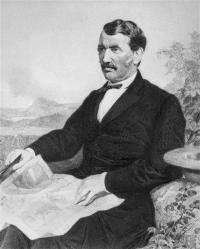 Livingstone's account was first communicated to the outside world by journalist Henry Stanley, whose famous encounter with the explorer in October 1871 was immortalized by the words: "Dr. Livingstone, I presume?" Later works, including the "Last Journals," were based on the journal that Livingstone wrote in 1872, after Stanley had resupplied him with paper. But it's Livingstone's field diary, improvised from bank checks and aging pieces of newsprint and written in ink made from seeds and berries, which Wisnicki claims as evidence for his theory that Livingstone's men were involved in the massacre. The raw notes have long been considered unreadable - a result of the unusual writing material, the tropical weather, and the unorthodox ink. But Wisnicki's team submitted the notes to spectrographic analysis. The field diary makes clear that Livingstone - an ardent abolitionist - was horrified by the moral character of the freed slaves sent to reinforce his expedition. He describes them as "senseless slaves with no honor." In Livingstone's account, they emerge as rebellious and violent - at one point he confides that "if they go anywhere I must go with them or murder is certain." In another passage, dated May 18, Livingstone says the slaves have mutinied and bought guns with his money. Those passages were either sanitized or excised from Livingstone's 1872 journal. Wisnicki claimed that the edits, combined with discrepancies between the field diary and the journal's descriptions of the massacre, suggest Livingstone may have had something to hide about the bloody incident. Jeal acknowledged that the slaves were "clearly very disobedient and violent men," but said it was unlikely that they would have gone on a rampage in Livingstone's presence. Followers of the great explorer can decide for themselves. Scans and transcripts of the diary were posted to website of the University of California, Los Angeles on Tuesday.